Tognetti R, Cherubini P (2009). 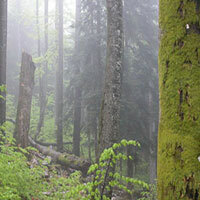 Change is in the air: future challenges for applied forest research. iForest 2: 56-58. 2 - WSL Swiss Federal Institute for Forest, Snow and Landscape Research, Zurcherstrasse 111, CH-8903 Birmensdorf (Zurich - CH). Forests provide a wide range of benefits to people. Forest plantations on former agricultural land for commercial and restoration purposes may enhance ecosystem services, including biodiversity conservation and carbon sequestration. Incorporating these ecosystem services into resource management decisions is of paramount importance. Efforts towards the sustainable management of forest ecosystems for climate change mitigation give opportunities to establish a new relationship between researchers and forests. Growing and competing demands for food, biomass, timber, and environmental services is posing severe challenges to effective forest governance, considering the impact of global change. However, tree plantations can hardly match biological diversity and structural attributes of the original forest cover, which warrants for future sustainable mitigation through forest activities. WSL Swiss Federal Institute for Forest, Snow and Landscape Research, Zurcherstrasse 111, CH-8903 Birmensdorf (Zurich - CH). Roberto Tognetti is a plant ecophysiologist and forest ecologist whose research interests integrate measurements over several spatial scales to explain the links between vegetation and environment. He has undertaken measurements of leaf processes (photosynthesis and transpiration) and traits (mesophyll structure, sink-source analyses), tree attributes (water relations, growth rate), stand features (carbon exchange, water use) and ecosystem functions (carbon sink, litter decomposition). He is currently appointed as associate professor of forest ecology and agroforestry systems at the University of Molise (Italy). Paolo Cherubini’s research interests lie within tree physiology, ecology, and evolution, with relevance to the knowledge and sustainable management of natural resources. He strives to understand the key processes behind tree growth. He obtained his Ph.D. in 1996 at the Universität Basel (Switzerland), and is currently Senior Research Scientist and Head of the Tree Physiology group at the WSL (Zurich - CH). He is also Adjunct Research Scientist at the Lamont-Doherty Earth Observatory of the Columbia University in New York (U.S.A.), and external lecturer at the Universität Zürich (Switzerland).